The concept of making a masterpiece even better may sound absurd to admirers of works of art. To true artists, resting on one's laurels is not an option as there is always room for improvement. Artists will always strive for innovation--—to improve, to enhance. Creativity thrives in the Goldilocks community. The country’s number one bakeshop strives for continual innovation, and has been serving up Filipino favorites for the past 50 years. While they do have their classics, they never shy away from opportunities to bring something new to the table. 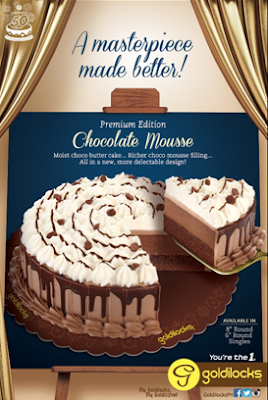 Goldilocks recently unveiled their new and improved Premium Edition Chocolate Mousse Cake. The dessert boasts of a moist choco butter cake with a richer chocolate mousse filling in an all new and more enticing presentation. Indeed, it is a masterpiece made even better. Grab the new and improved Chocolate Mousse Cake in all Goldilocks branches nationwide.